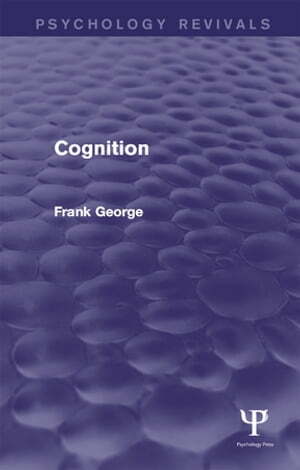 Collins Booksellers - Cognition by Frank H. George, 9781317418634. Buy this book online. Originally published in 1962, the problems of cognition dealt with in this book include learning, perception, thinking, memory and linguistic behaviour. It is not a textbook in the ordinary sense, since it presents a particular approach to the subject through experimental psychology, and also, to some extent, through philosophy, cybernetics and logic. A brief mention is made of ethological and physiological matters. It argues that cognition is a stepping-stone to integration with allied sciences. A large-scale study of the organism-as-a-whole needs to be supplemented by other biological and logical studies, but preparatory to this, cognitive psychologists must try and discover more rigorous ways of presenting their theories and models, since the mode of communicating an idea can never be wholly separated from that idea. Furthermore cognition, even at the organism-as-a-whole level, needs to broaden out and link up with social studies and studies in personality and individual difference. This book, pointed to a new direction that psychology should take; without contributing greatly to existing knowledge in the obvious sense, it suggests new methods and new ways of regarding the existing knowledge at the time.